The Navy tested new targeting technology on the Joint Air Ground Missile during a first flight test on an AH-1Z helicopter last month at Naval Air Station Patuxent River Md. "During the flight, aircrew aboard the AH-1Z navigated the missile through various operational modes and exercised its active seeker to search and/or acquire targets, demonstrating its compatibility with the aircraft," a NAVAIR statement said. Liam Cosgrove, JAGM flight test lead, said the flight test will pave the way toward live fire tests in coming months, a report from the US Navy said. The Army-led JAGM missile was originally designed with a tri-mode seeker using millimeter wave, IR and laser guidance technology. While a senior Army weapons developer said its current technical configuration is not available for discussion for security reasons, he did say the new JAGM seeker was extremely advanced. "JAGM will have the same back end as HELLFIRE and same production line," Brig. Gen. Robert Rasch, Deputy Program Executive Officer, Missiles and Space, told Warrior Maven in an interview. According to Army statements, the adverse-weather-capable JAGM System will enable warfighters to attack critical, high-value, fixed and moving, and fleeting targets day or night in battlefield limited visibility conditions from significant standoff ranges while remaining fully effective against a variety of countermeasures. The US Army is massively increasing production and delivery of HELLFIRE missiles to keep pace with upgrades to the weapon and a continued fast-growing use of the weapon around the globe, senior Army officials said. "We will increase HELLFIRE production by 50-percent by 2019," Rasch said. The war against ISIS, along with widespread multi-service and international use of HELLFIRE has depleted existing inventory of the weapon and generated a fast-growing national and international demand for HELLFIRE missiles, senior Army weapons developers told Warrior Maven. 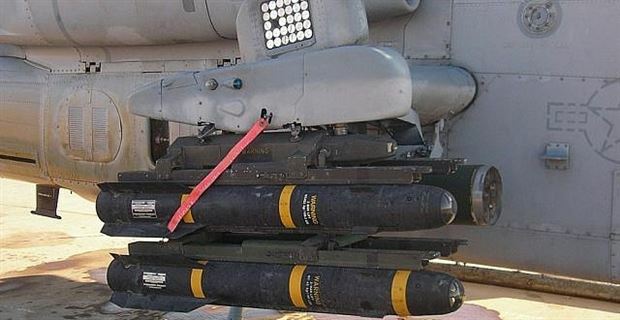 As the principle manufacturer of HELLFIRE missiles, the Army provides the weapon to national and international entities to include the Marine Corps, Air Force and Navy arsenals, among others. Many partners in the U.S.-led coalition to destroy ISIS are firing HELLFIRE missiles as well. "There is so much demand for that missile. It is used on more than 20 different platforms by more than 20 nations," Rasch added. While precision-guided air-to-ground weapons are typically needed during aerial bombing efforts, they are of particular urgent value in the ongoing attacks on ISIS. ISIS fighters regularly hide among civilians and at times use women and children as human shields, making the need for precision all the more pressing. In fact, during the ongoing ground war operations in Iraq and Afghanistan over the last 10 to 15 years, Army weapons developers have modified and upgraded HELLFIRE missiles a number of times. In one instance roughly 10 years ago, Army weapons developers engineered and integrated a special metal augmentation casing around the warhead to increase fragmentation blast effects. The innovation was specifically designed for attack upon small groups of individual enemy fighters on the move - as opposed to more traditional targets envisioned for the HELLFIRE. The HELLFIRE missile can use semi-active laser technology. A ground target can be designated or “painted” by a laser spot from the aircraft firing the weapon, another aircraft or ground spotter illuminating the target for the weapon to destroy. The Army has already begun development of anext-gen HELLFIRE - the Joint Air Ground Missile (JAGM). The JAGM missile was originally designed with a tri-mode seeker using millimeter wave, IR and laser guidance technology; While Rasch said its current technical configuration is not available for discussion for security reasons, he did say the new JAGM seeker was extremely advanced. "JAGM will have the same back end as HELLFIRE and same production line," Rasch said. Although the HELLFIRE began as an air-to-ground weapon, the missile has been fired in a variety of different respects in recent years. The Navy has fired a Longbow HELLFIRE from a Littoral Combat Ship, or LCS, to increase its lethality; the Navy's 2017 budget request asked for Longbow HELLFIRE missiles, beginning with the LCS surface-to-surface mission module, Navy officials told Scout Warrior. Also, the Army has fired the weapon at drone targets in the air from a truck-mounted Multi-Mission Launcher on the ground and international U.S. allies have fired the HELLFIRE mounted on a ground-stationed tripod.